Today, Pangolin’s Puzzle by Hero Factor Games is launching on iOS and Android. I was honored to work on the game’s character animation and audio, and while I’ve showcased some of the animation work earlier, I haven’t put up any of the music. I’d appreciate you checking the game out! It’s been a fun project to work on! I have a great deal of respect for the video game music composers of the 1980s. Using technology that looks extremely primitive and limiting now, the greats like Koji Kondo and Nobuo Uematsu were able to create amazingly catchy songs to accent the games that we played. Using the sound card limitations of the NES (Nintendo Entertainment System), I've composed some songs myself, and they're now for sale on the Unity Asset Store! Click on the image below to check them out! It occurs to me that those who don't follow me on Twitter might not know what I've been up to recently. First of all, why aren't you following me on Twitter? And more importantly, I should tell you about things! I've been doing contract work since October of last year, and one of my biggest projects has been for a game called "Pangolin's Puzzle" by Hero Factor. It's a game starring Katiti the pangolin as she uses her wits to protect herself from poachers and find her kidnapped mother. I've had the opportunity to provide animations, music, visual effects, and other assets to the game. I'll be uploading the composed music soon, but for now, here's a selection of animated assets that I've created. From a technical side of things, these animations were created using Spine. Spine is a tool that lets you take a static piece of layered art from Photoshop, apply puppeteering bones to it, and then animate it. General Iroh, from Avatar the Last Airbender. Technically, there were no marshmallows shown on the show. But if he had some, he'd totally toast them himself. I admit it. I love Daylight Savings Time. Not the actual day when it happens, of course. The morning of Daylight Savings can be a disorienting mess. But to me, it's all worth it, because at 6 PM that day I'll be looking outside and have the sudden realization that the sun is still out. I love that! The moment I realize that, it feels like spring has arrived, even if there's still snow on the ground. DST is the beginning of spring, and for the next 8-ish months, the days feel longer. And at what cost? Beyond the minor disorientation of this weekend in March, what am I losing? 4 AM sun in the summer? What am I going to do with sun at 4 AM? Listen to the birds chirp an hour earlier? I know I'm in the minority. Everyone wants to get rid of DST... and over the past few years, that argument is something I've also appreciated. We, as a society, are running out of things to be united about. Many major topics that used to be debated in relatively rational ways have gotten political and partisan. It used to be that we could at least talk about the weather with a stranger, but now that's even a potential hazard if the topic of global climate change pops up. I did not think this through very well. There's something important that you should know about me. I have no idea exactly what I'm wrong about, but have no doubt, I'm wrong about something. I am a human being, with imperfections and a limited view of the world. Yet, to survive in the world, I have to form opinions about what I see and do, and then act on them. And, because of that, something I believe to be right is, in fact, wrong. I don't like thinking about that. I like being right. And in some cases, I don't know which of my beliefs is right and which is wrong. So, I have two choices. The first is to huddle around other people who are like-minded, to not have my beliefs challenged, and to learn how to strengthen what I already believe. The second is to expose myself to contrasting beliefs, and to learn about everything around me, whether or not it conforms to what I know to be true. If I only do the first, I'll become ignorant and stubborn. If I only do the second, I'll have no foundation to base my life, and become unstable. And so, I must do both. I must be who I am, and live as I believe I should live, but I also must pay attention to what's around me and consider the differing views that cross my path, because that is how I'll grow as a person. You know who else is wrong? The ten-years-ago version of myself. That guy had a lot of things wrong. I'm glad I'm not him. 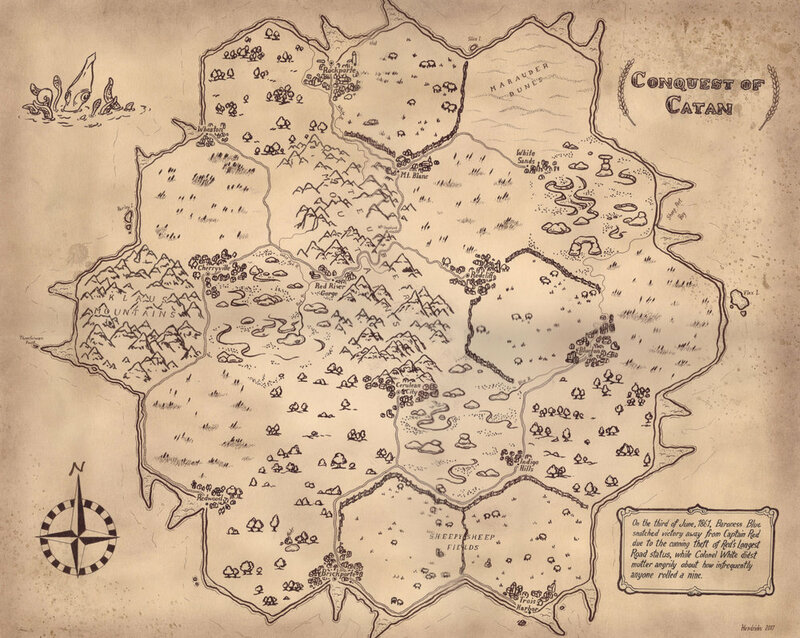 Now, the funny thing is that, when I was first planning to do something Catan-themed for the art show, I was not planning to make a map at all. I was going to make a realistic-looking painting of Catan as seen from the air (the kind of thing you'd see advertising an island paradise in a travel brochure). It's why I practiced painting water for my previous Nemo-themed artwork. But I didn't like that idea and went with a map instead. Oddly enough, even though I absolutely love maps and study them frequently, I've never attempted to make one at this scale before. It was quite fun! I've added a new music playlist to my page: Hyper Hippo Games! Hyper Hippo is my current employer, and I've made a decent amount of music for them, so I figured it was time to collect most of it in one place. Enjoy! There's no easy way to say goodbye to a virtual world. When a TV show ends, after producing seasons' worth of content, it gets to have its finale. The fans will be upset, begging for it to continue, but after the show is done, they still have the opportunity to relive it exactly as it was by catching reruns or watching DVDs of it. When a series of video games ends, the fans get upset, but they still usually have the ability to dust off the old game console, pull out the controller, and play the game as it was. But a virtual world... they never die gracefully. The moment the plug is pulled, it's gone. It ceases to exist, because it was never about the art, it was about the community. On March 29, Club Penguin will close its doors. I hadn't visited Club Penguin in years, to tell you the truth. But when I heard the news a few days ago, it still hit hard. Club Penguin was my introduction to the video game industry, and what a way to begin. The silly virtual penguins and their furball pets that I helped to create have been seen by over 1.5% of the people on Earth. A digital clock that was somehow powered by throwing snowballs at it. Kids using the game to learn how to read. Hot sauce as jetpack fuel. A western party that was voted for, but that no one seemed to want when it actually happened. Secret agents that were horrible at keeping their identity a secret. An autistic child whose experience in making friends online gave him the confidence to make friends in real life. Wearing snowshoes, a sweatshirt, a bowtie, and a hat made out of fruit all at the same time just because you could. A Friday afternoon with a dozen other artists sketching ridiculous concepts about what penguin sumo would look like. Seeing Club Penguin gift cards pop up in my local supermarket for the first time. Rejoicing at the Club Penguin Beta Party that we were able to cram over 60 penguins into one room without the game crashing. From May 2005 to May 2009, my job was to help make Club Penguin awesome, and it was magical. There was stress, there were conflicts, but when I look back at it, the good parts easily outshine the bad. And that is what I hope for you. You, the faithful fans of Club Penguin, whether current or former, I hope that when you look back at this little world of flightless birds, you remember the good outshining the bad. I've heard many stories of people being inspired by Club Penguin to follow career paths that they might not have otherwise pursued. I've seen others get their first taste of caring for their community by donating to Coins for Change. Even with Club Penguin shutting its doors – a decision that I believe is unwise, considering the population of people that still care about this virtual world – examples like those mean that I can't dwell on the negative side. Club Penguin isn't truly going away, of course. Club Penguin Island is coming out as a mobile app, and I have hope that it's able to build the same sense of community. I hope that the team working on Club Penguin Island will value their fans and listen to their feedback, and I hope that the Walt Disney Company will allow that team the room they need to make the same kind of frequent improvements that made Club Penguin great. I have more to say, but for now, I'll end the blog post here. I'm thankful that I and the thousand other past and present employees of Club Penguin were able to make you smile. Now go, waddle on, and make new memories. I, like most artists, am pretty horrible at self-promotion. This extends to games that I have created, which is likely why I haven't yet mentioned Phrase Shift on this blog. Phrase Shift is a word puzzle game that I created for Hyper Hippo Games. It's already shown up on Android and iOS, and is launching on Steam this week. Sample puzzle. To solve, you slide the words in the definition left or right until the answer is spelled down the center line. To answer "Jam's glass container", you spell JAR down the center. Simple enough, right? The game should be free, and then you sell level packs. Word puzzle games don't sell well. Most of your audience will just see them as edu-tainment. If you wanna make a popular puzzle game, for heaven's sake, don't make the user think! Make it as easy as possible to solve, until the solution is just out of reach, and then charge them more money to be able to solve the thing. I hate this. I just want to go back to simplicity: you buy the game, you play the game. No unfair tactics, no shady business dealings. I also would really like to believe that there are a few of you out there that enjoy word games. If this is you, please purchase Phrase Shift. I'd really appreciate it. The Steam version is launching with 600 puzzles (and the mobile versions will be updated to have those puzzles soon as well). It's less than a penny a puzzle! Avatar the Last Airbender is my all time favourite animated TV show. Period. Canadian Thanksgiving and Halloween both happen in October. For some reason, they connected in my mind today, and this was the result. Created this for a friend's birthday card. Cake meets inside joke. "And you also know a Swan? So do I! Wow, small world, eh?"